Producer Boeing Co. and Raytheon Co. The Sea-Based X-Band Radar (SBX) is part of the U.S. Ballistic Missile Defense System (BMDS) and is designed to detect and establish precise tracking information on ballistic missiles, discriminate missile warheads from decoys and debris, provide data for updating ground-based interceptors in flight, and assess the results of intercept attempts. 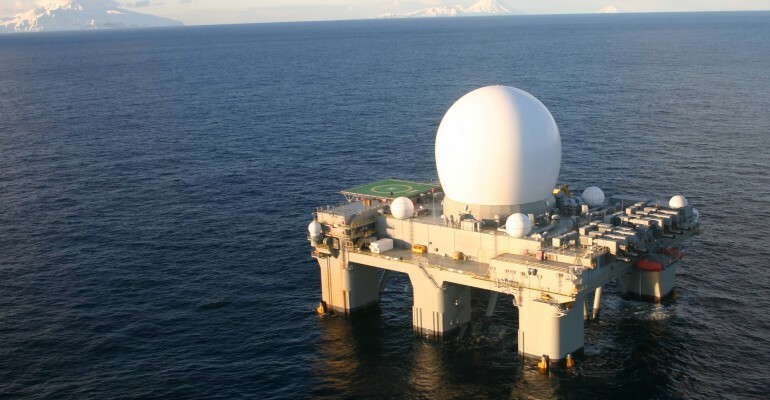 The radar on the SBX is housed under the large, white radome and is considered the largest and most sophisticated phased array electro-mechanically steered X-band radar in the world, with approximately 45,000 transmit/receive modules forming the radar beam. The radar beam is capable of detecting an object the size of a baseball at up to 2,500 miles away. [i]The radar also uses 69,632 multi-sectional circuits to transmit, receive, and amplify signals, and the elevation at which the radar is positioned abroad the platform allows it to track objects as they fly toward, over, and away from the vessel. Deployment– The SBX-1 officially deployed in 2006 as part of the BMDS in the Pacific to detect and track ballistic missile threats to the U.S homeland and Hawaii and Alaska. During the mid-late 2000s, the SBX traveled around the Pacific including the waters around Hawaii and Alaska and spending time in port along the U.S. west coast. During the mid-2000s, the SBX was homeported in Adak, Alaska although it never actually visited the port or moored there. In 2009, the SBX relocated to the waters around Hawaii, after North Korea threatened the island with nuclear attack. The SBX is currently deployed in the Pacific Ocean to monitor for potential North Korean ICBM test launches. SBX-1 left Hawaii in January 2017. The radar had previously been moored in Pearl Harbor on limited test support status since the beginning of FY2013. It has detected and tracked several targets or interceptors during GMD tests, including one in May 2017 while at sea. December 15, 2010: The SBX radar tracked and provided real time data during FTG-06a in which an EKV was supposed to intercept a target. December 1, 2007 – April 1, 2008: SBX-1 traveled more than 4,000 nautical miles across the Pacific Ocean. September 28, 2007: The SBX radar participated in a data collection mode during a GBI flight test intercept with the target missile launching from Kodiak Island, Alaska and the GBI from Vandenberg AFB, California. December 2005: The SBX-1, aboard the Blue Marlin, passed through the Strait of Magellan and into the Pacific Ocean. July 2005: MDA officially named the semi-submersible vessel and radar system the Sea-Based X-Band Radar-1 or SBX-1. The SBX-1 also began sea trials in the Gulf of Mexico. May 2005: The radome, the large white dome visible on top of the platform, is installed over the x-band radar to protect it from the elements. April 2005: The x-band radar was installed on the platform in Ingleside, Texas. January 2003: The United States government purchased a 50,000-ton, semi-submersible, self-propelled, seagoing platform to carry the radar system.